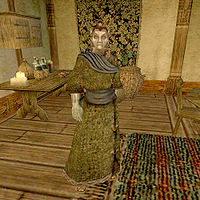 Folms Mirel, a Dunmer enchanter, is the head of the Caldera Guild of Mages. He is one of the people who will let you join and advance in the guild. However, he has no unique quests and is of little relevance in the regular game. If you have installed the Master Index official plugin, however, he will send you on a quest to collect the ten Propylon Indices, and once you've completed it, you can talk to him to be transported to any of the ten Dunmer Strongholds. Other than that, he provides Enchanting services, as well as having a selection of magical items for sale, but only for guild members ranked as Conjurer or higher. He has some of the rarest scrolls in the game. He wears a common robe with matching shoes. Aside from his natural resistance to fire and the sanctuary provided by his ancestors, he knows the following spells: Sleep, Wearying Touch, Distracting Touch, Wild Distraction, Deadly Poison, Poisonbloom, Viperbolt, Lightning Storm, Dire Weakness to Fire, Dire Weakness to Frost, Dire Weakness to Magicka, Dire Weakness to Poison, Dire Weakness to Shock, Sotha's Mirror, Vivec's Feast, Spell Absorption, Blood Despair, Seryn's Blessing, Strong Resist Fire, Strong Resist Frost, Strong Resist Magicka, Strong Resist Poison, Strong Resist Shock, Restore Intelligence, Restore Speed, Restore Willpower, Dispel, Daedric Bite, Frost Bolt, Frost Storm, Detect Creature, Shadow Weave, Vivec's Wrath, and Weakness to Corprus Disease.